Germantown Academy won the 36th annual Triangle Club Tournament at Norristown High by topping LaSalle College High School, 57-43. These two well coached teams entered the championship game with identical records of 6-1. Coach Jim Fenerty’s victorious Patriots were tournament runner up to Norristown in last years tournament. Despite being hit hard by graduation and returning only 2 of his top eight players, Coach Fenerty waved his magic coaching wand, preached hard work and team chemistry and his team handed him his 396th career win at Germantown Academy and the first place trophy. Germantown led 19-14 at halftime in a hard fought defensive battle. The LaSalle Explorer’s played a tough man to man defense with inside size advantage of 6-4 Joe Brown, 6-5 Brennan Woods (eight points) and 6-9 Steve Collins. LaSalle scoring was led by lightning quick guard Eddie Mitchell 12 points. Back court partner Michael Poncia chipped in with 8. Action gets underway in the championship game. As hard as they tried LaSalle just could not catch up to Germantown. The task was not made easier by the absence of the teams leading scorer 6’3 Troy Hockaday who fell victim to the flu and did not dress. 2009 tourney Co-MVPs Austin Curry and Cameron Ayers with Triangle Club President Barbara Harrington Hladik. Senior guard Austin Curry scored 9 straight points in the second half to lead the Patriot’s charge as they kept LaSalle on the run. Curry’s floor leadership was vital as were his game high 20 points. The score was 39-32 entering the 4th period, with Germantown holding a slight lead. Cameron Ayers was a perfect 10 for 10 from the foul line and was Germantown’s second leading scorer finishing with 16. Ayers scored 27 in Tuesday’s game against Conestoga. Teammates Curry and Ayers pulled a Tournament first by being named Co-MVP’s. Other key Patriot contributions came from Jake Bell (eight points), Jim Hammer (six points) and Beau Jones hauled in a team high eight rebounds. LaSalle coach Joe Dempsey was certainly disappointed his Explorer’s couldn’t pull out the championship victory, but reminisced about attending the Triangle Tournament years ago with his father. Joe grew up in nearby Bridgeport. The 2009 Triangle Club Basketball Tournament had an unfamiliar winner. Norristown had won the previous 5 Tournament championships. This year, the Norristown Eagles appeared in the consolation game nipping the Conestoga Pioneers by a score of 50-48. 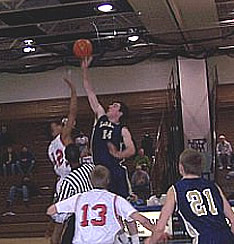 The last time Norristown had not been in the tournament finale was back in 2001, when Kennedy-Kenrick topped Parkway. Conestoga, which last participated in the tournament back in the late 1990’s, had graduated 9 seniors last season. Coach Mike Troy’s rebuilding efforts started to show progress in Wednesday’s match up with Norristown. Triangle Club President Barbara Harrington Hladik with some of the members from 2009 tournament champions Germantown Academy. Conestoga entered the tournament with a 2-3 record, having dropped a couple of tough one point games. They lost to Germantown Academy in Tuesday’s opening round by a score of 71-55, despite a strong second half. Against Norristown, Conestoga (playing many underclassmen) missed 10 of 17 free throws and lost another close one. 6’3 junior Dexter Bridge led the Pioneers with 15 points while 6’5″ senior Austin Smith chipped in with 12. Norristown entered the tournament with an undefeated 6-0 record. Minus star guard and leading scorer Sheldon Mayer (out with an ankle injury) they could not match up with LaSalle’s height and 2-3 zone defense on Tuesday. The Eagle’s cold shooting (34%) and only 4 free throw attempts sent them to their seasons first defeat, 45-35. In a break out game for junior guard Aaron Webb, he lead the Eagle’s with 13 points. In Wednesday’s consolation match up with Conestoga coach Mike Evan’s was determined to get his team back on another winning streak. The game opened with a brisk pace and had the looks of a high scoring affair, with Norristown leading 34-30 at the half. Both Norristown and Conestoga tightened up their defenses in the second half and missed free throws by both teams (Norristown was 13 of 29) slowed the game to a tempo that Conestoga preferred. Norristown scored only 8 points in each of the last 2 quarters, while Conestoga scored 5 points in the 3rd quarter. The Pioneer’s put up 13 in the last frame and just missed a last second game winning shot as the buzzer sounded, giving Norristown the 50-48 victory. Rasheed McCray, a 6’2″ junior forward, led the Eagle’s with 14 points. Lightning quick guard Chris Davis tossed in 2 three point field goals and finished with 13 points. Senior forward Jahquil led the defensive charges with six steals and eight rebounds.